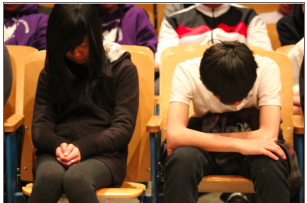 In Visitacion Valley Middle School, an urban middle school in South San Francisco, CA, students start and end their days with 15 minutes of meditation, according to this wonderful post by Kyle Palmer on KQED’s State of Health blog. Since the school started the program, fewer teachers have resigned, student attendance rate is at 98 percent, suspensions are down and grades are up. The program was put together by the David Lynch Foundation and the San Francisco-based Center for Wellness and Achievement in Education (CWAE), which trained teachers and counseled students on meditation techniques. by trauma in all its forms,” according to a report on DarienPatch.com. A more thorough report appeared earlier this month on Courant.com, which noted that it’s a five-year program, and Connecticut was one of five states that received the monies. The “Rhode Island Model” for incorporating a cross-agency trauma-informed approach to preventing child trauma was featured at the Child Welfare League of America national conference in Arlington, VA, according to a report on GoLocalProv.com. The partnership involves Family Service of RI, the Providence Police Department and the state Department of Children, Youth and Families. One example of its approach is that a Family Service of RI worker accompanies the Providence police on routine patrols and drug raids to provide immediate help to any children who are present in an altercation, investigation or raid. If you’re interested in the wide-ranging array of new ideas and solutions percolating in the child welfare community, check out the workshops from the Child Welfare League’s 2012 three-day conference, happening now in Arlington, VA. The name of the confabulation is, appropriately, Making Children a Priority: Leading Change.